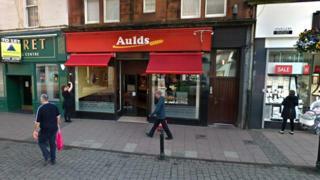 Aulds has confirmed that 18 of its 26 Scottish bakery shops have closed, with the loss of 105 jobs. The announcement came after the chain put its retail business into liquidation last month due to "unsustainable" losses. However, its eight remaining stores in the west of Scotland will remain open, as will its administration and distribution headquarters in Greenock. Aulds said the move, which is part of a turnaround plan, had secured 75 jobs. Liquidators from RSM Restructuring Advisory were appointed to the group's retail arm, Thomas Auld & Sons, after the company struggled with increasing ingredient, distribution and wage costs over several years. That part of the business was formally closed on Wednesday. A new retail arm is now in operation. Aulds' bakeries in Greenock and Inchinnan, near Glasgow Airport, will continue to operate and supply shops, safeguarding 200 other jobs. Aulds managing director Alan Marr said: "It goes without saying that we deeply regret the jobs lost and do not underestimate the impact that will have on the individuals involved and their families. "We only embarked on this course of action after exhausting every other possibility, but we were simply unable to sustain the losses being made by the retail business. "We're extremely pleased that we've been able to preserve 75 roles as part of this process and keep the Aulds brand on the high street. "The response and support from our customers has been very encouraging and we'd like to thank them for their loyalty during a difficult period for our business." Founded in 1900 by Thomas Auld, the company has remained in the family name for four generations.